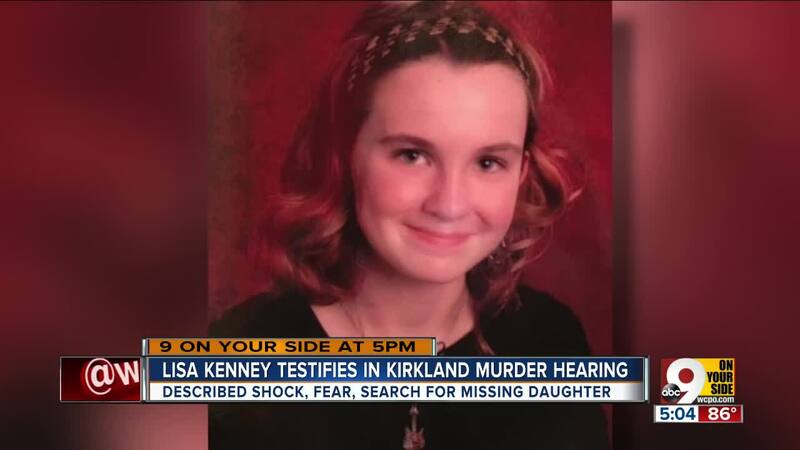 CINCINNATI – Esme Kenney’s mother recalled that her 13-year-old daughter asked her to go jogging with her on the fateful Saturday afternoon in 2009, but she stayed home to clean up a mess of drywall dust that the kitchen remodelers had left on the wooden floor. “I got lost in doing that and then I thought, ‘Oh my god, Esme’s not back!’ I knew something was wrong. I just had that feeling,” Lisa Kenney said in video testimony played in court Thursday. Lisa said she immediately ran from her house - without shoes on – across the street to the reservoir where Esme was going to run. Lisa said she found a pair of men’s pants under a tree. “It was just alarming,” she said. Then she saw something in the distance. “I thought it might be her collapsed,” Lisa said. But it turned out to be a bag filled with old clothes and a bottle of beer. “I ran to the corner and found a case of beer,” she said. That’s when she first thought Esme might have been abducted. She ran home and called her husband, then 911. Sitting in front of a video camera, Lisa went on to describe the terror-filled hours that followed – hours of searching and worrying and searching some more, crawling through dense brush and honeysuckle, the run-around she got from District 5 police, the help she got from a police officer who lived on her street who went searching with her partner and found Anthony Kirkland in the woods along Esme’s jogging path with Esme’s watch and iPod on the ground nearby, the hours there was no communication from Cincinnati police after Esme’s body was found. On the video, Lisa Kenney, who moved to Washington state to try to escape the anguish of her daughter’s murder, managed to stay composed as she described what happened that March 9 day when Kirkland snatched Esme, dragged her into the woods, raped and strangled her and burned her body. It wasn’t until the end of the 30-minute interview, when prosecutor Joe Deters showed her Esme’s photo and asked her to identity her, that Lisa cried. The jury watched Kenney’s stoic and gripping deposition on the second full day of testimony in Kirkland’s resentencing hearing. The jury has to decide whether Kirkland, already serving life for two previous murders, gets the death penalty for the murders of Esme and 14-year-old Casonya Crawford or another life sentence. 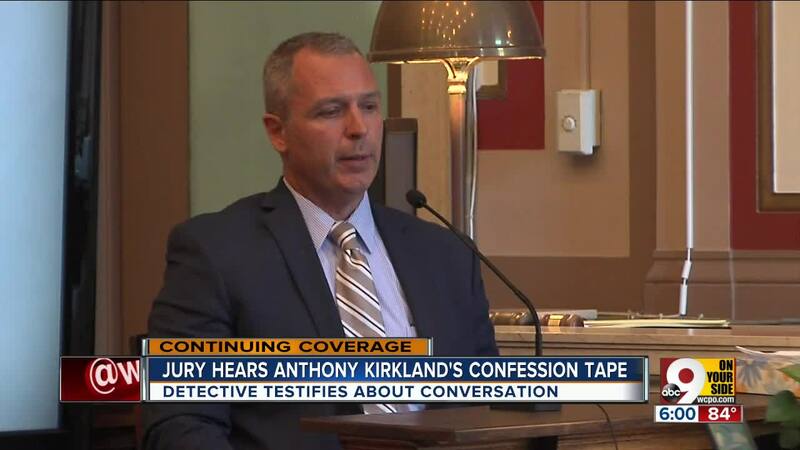 Neither Deters nor the defense attorneys who flew to Washington to take Lisa’s deposition on June 8 asked what sentence she thought Kirkland should get. Instead, Deters began by asking Lisa about her only child. “She was a total joy. Had a bubbly personality and loved people. Was excited to be alive,” her mother said. Lisa said Esme was a ninth grader at the School for Creative and Performing Arts. She played the cello and guitar and sang in the choir. “She was the baby of the family. It was like she was 9. We drove her to school, picked her up,” Lisa said. It was a “gorgeous day” - the first nice day of spring, Lisa remembered – but Lisa nixed jogging because she was determined to clean up the mess in her kitchen. “I just wanted to get the dust off the floor. It was driving me nuts,” she said. “I told her to run around the reservoir one time and come right back." Fear gripped her, she said, and she called her brother to tell him where she was. “I wanted somebody to know where I was in case I didn’t come out. It was the scariest thing I’d ever done,” she said. After finding nothing, she said she looked down the street and saw her husband talking to two Cincinnati police officers. “The cops were two young guys,” Lisa said. She said she told them Esme was missing but when they asked how old she was, they dismissed her. "I was trying to tell them that she had been abducted,” Lisa said. “They didn’t get it. They let us know if she’s not home by midnight to call them. Lisa said she called friends and posted on Facebook that Esme was missing, and friends immediately joined the search. “One group drove around the I-275 loop putting flyers up,” she said. Finally, her friend Eileen suggested she call the police woman who lived on her street. Lisa said she didn’t know her, but she called her anyway. “She had just come on duty and she said, ‘OK, I’ll check it out,” Lisa said. “She and her partner. They found Anthony Kirkland sitting under a tree. "I got a call from her and she asked, 'Did Esme have an iPod and a watch with her? '” Lisa said. Lisa said she answered yes. Esme had gotten them as Christmas gifts. At that point, Lisa said she went to the site where the officers were. Deters asked Lisa when she found out Esme was dead. “I didn’t find out until morning,” she said. They barely slept during the night, she said. She said could hear helicopters overhead searching for Esme. “To this day, whenever I hear helicopters, I think of that,” she said. The police never called, Lisa said. She said her husband called hospitals in case Esme was “just hurt.” They turned on the TV and heard that the Amber Alert had been called off. “We called District 5 and they said, ‘Oh, hasn’t anybody called you yet?’” she said. "A chaplain and a police officer came to our door very early in the morning and told us that Esme was dead," Lisa said. On the video, Deters stood up, leaned over to Lisa and showed her a picture. "I want to hand you what’s been marked as state’s exhibit No. 31," Deters said. "Can you identify that person?" "That’s my daughter, Esme,” Lisa said, and tears filled her eyes. The attorneys said they had no more questions. The interview was over, but not Lisa’s nightmare. There was one positive note: Following Esme's death, Cincinnati police changed its protocol for how missing juveniles are investigated.